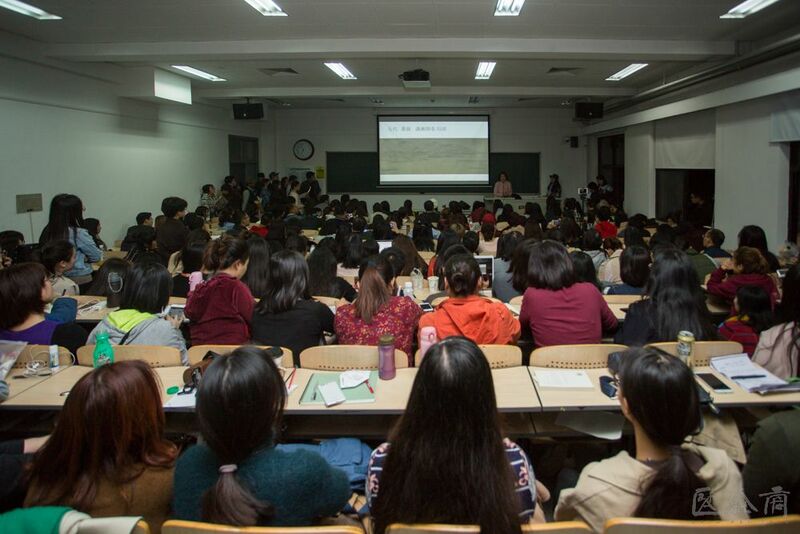 On October 24, 2017, at the event when “Paintings and Calligraphic Works of Zhao Mengfu” and “A Panorama of Rivers and Mountains: Blue-green Landscape Paintings from across Chinese History” were held at the Palace Museum, Beijing, Associate Professor Shao Yan from the School of Humanities, CAFA, gave a keynote lecture entitled “The Guide to the Zhao Mengfu and Wang Ximeng’s Dream World – Beijing Palace Museum Annual Exhibition”. 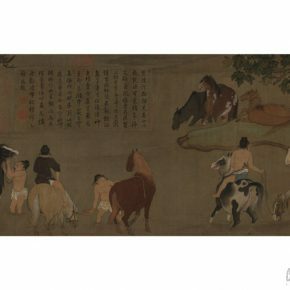 “Paintings and Calligraphic Works of Zhao Mengfu” is on show at the Hall of Martial Valor (Wuying Dian), featuring a total of 136 works, among which 60 of Zhao Mengfu’s works are on display; it features 85 works of “A Panorama of Rivers and Mountains: Blue-green Landscape Paintings from across Chinese History” at the Meridian Gate (Wu Men). 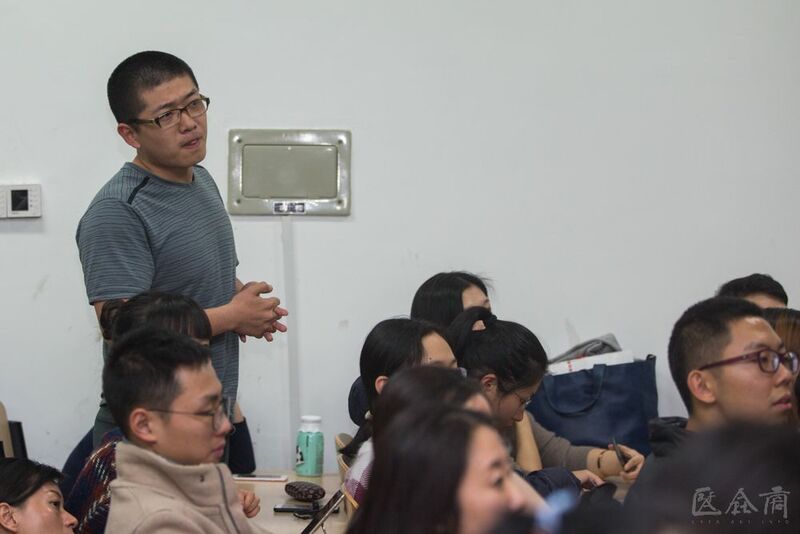 First of all, Shao Yan introduced the display of the exhibition hall and the sequence for a visit. Different exhibitions offer different ways of looking at things, Shao Yan explained the classic works in detail. 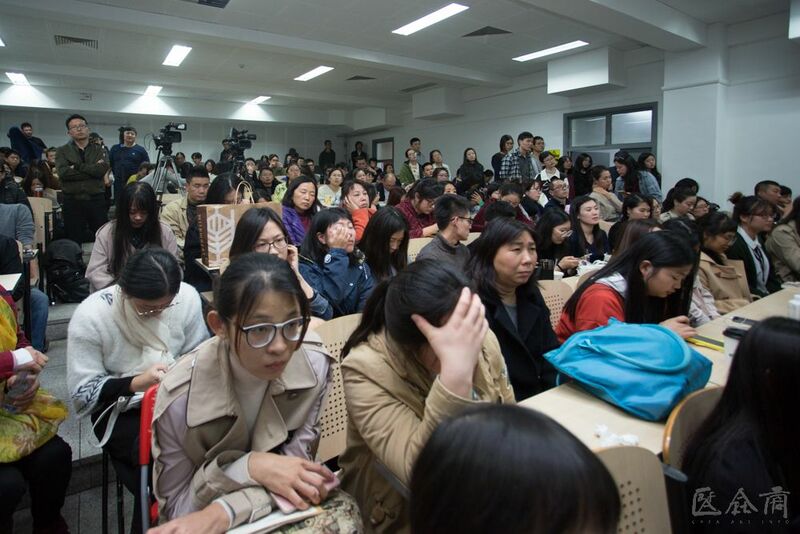 What is the meaning of an academic exhibition “Paintings and Calligraphic Works of Zhao Mengfu” for the ordinary audience? 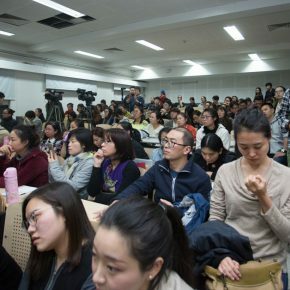 On the one hand it helps people to understand Zhao Mengfu, as well as his works and style. 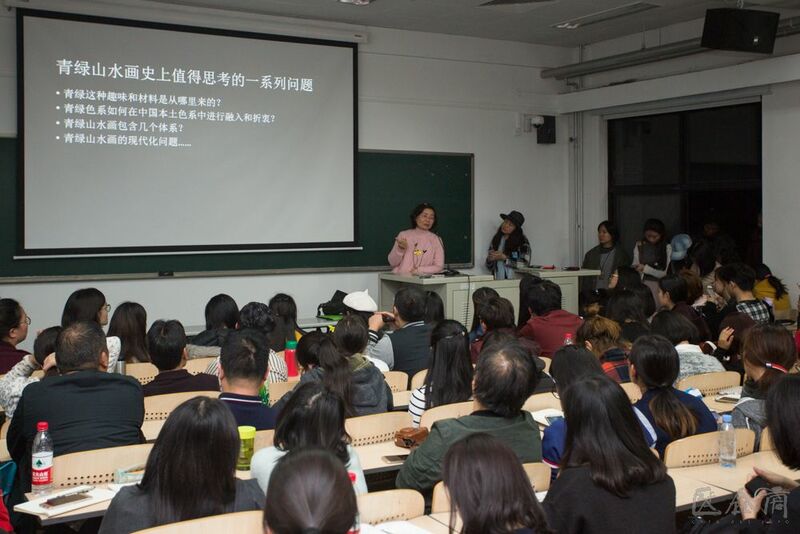 On the other hand it helps people to understand how art historians work, namely how they learn Zhao Mengfu: how the art historians face objects for research, how to deal with the object for research, how to ask questions and get some views? 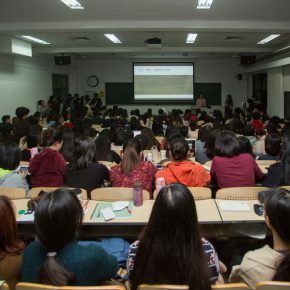 “Paintings and Calligraphic Works of Zhao Mengfu” is a classic case study, and a typical academic case, although it might be less entertaining than “A Panorama of Rivers and Mountains. 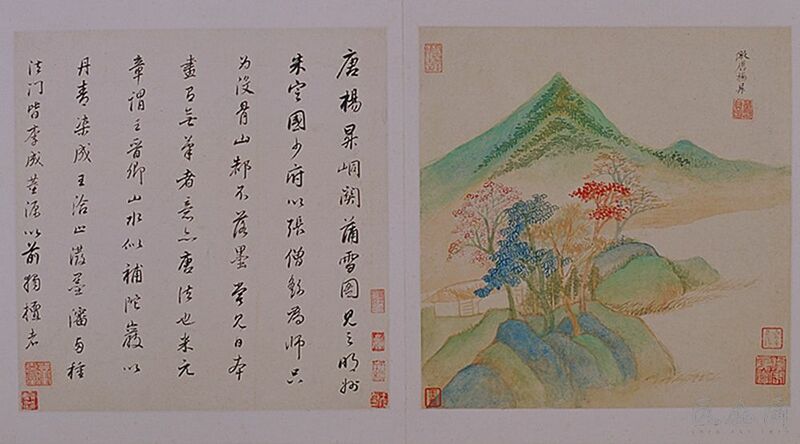 The exhibition is displayed depending on the context of art history, and it is divided into four parts: Roots – Artistic Origin of Zhao Mengfu; Chinese Painting and Calligraphy Shining upon Each Other – Artistic Achievements of Zhao Mengfu; Rhythm of the Pines and Snow – Zhao Mengfu’s Artistic Influence; Obvious Difference – Discrimination of Zhao Mengfu’s Chinese Painting & Calligraphy. Watching the exhibition is a conversation with the curator. 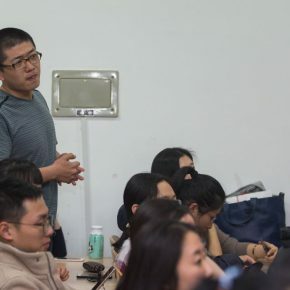 Taking “Roots – Artistic Origin of Zhao Mengfu” as an example, Shao Yan explained the curator’s intention to set these works. 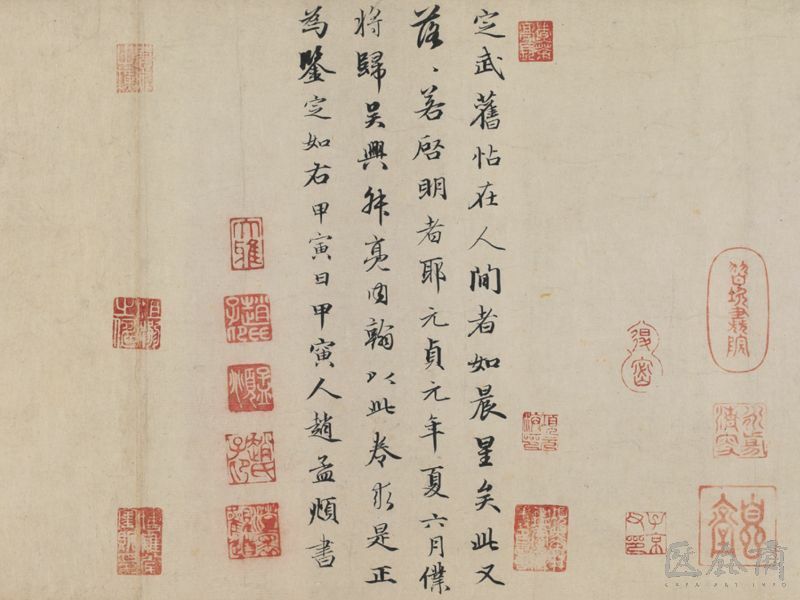 Zhao Mengfu’s “Postscript Written in Running Hand to Wang Xizhi’s Lanting Preface” is attached to Feng Chengsu’s replica of “Wang Xizhi’s ‘Lanting Preface’”, which is the evidence of Zhao Mengfu’s early study of Wang Xizhi and Wang Xianzhi. 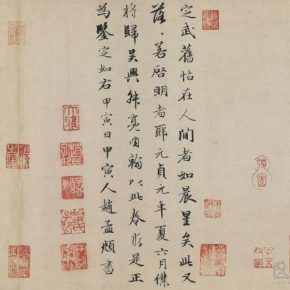 Because Zhao Gou’s calligraphy dominated the Southern Song Dynasty, and Zhao Mengfu was from the imperial clan of the Song Dynasty, he was greatly influenced by Zhao Gou when he was beginning his study of calligraphy, “Hou Chi Bi Fu in Cursive Script” reflects his family tradition and the calligraphic style of the time. “Xiaoxiang Scroll” by Dong Yuan was the key to Zhao Mengfu’s landscape painting, Zhao’s retro returned to Dong Yuan, ignoring the Northern and Southern Song Dynasties, in order to establish a new tradition – the interest of literati landscape painting, directly opened the style of “Four Masters of Yuan”, with a great impact on future generations. Such an academic exhibition’s display level relies on academic achievements. Many calligraphic works survived and many are studied. 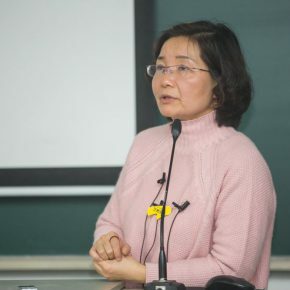 The second part is based on the research of Wang Lianqi, a scholar from the Palace Museum. It is divided into four stages. Because there are only a few paintings and little research, it does not have a detailed classification of stages and subjects. The development of identification in recent years is reflected in the exhibition. For the art historians, the display is excellent because the whole scroll is unfolded. 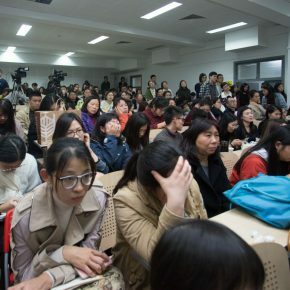 The study on Zhao Mengfu is difficult to identify. 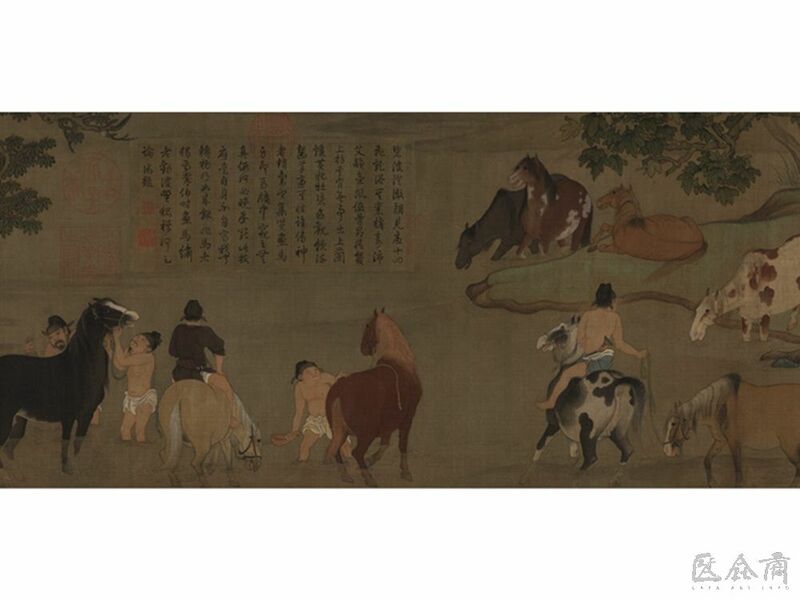 Despite the 4th part that is a special display of forged pieces, Shao Yan personally thought that there were still many works from the whole show that were doubtful, for example, Zhao Mengfu’s “Autumn Poetry Scroll”, “Bath Horses Scroll”, etc. 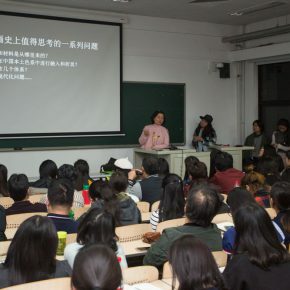 Shao Yan humorously stated that Zhao Mengfu was not a “genius” figure but the “King of study”; he was not perfect and his calligraphic level was not stable. It is the second time this has fully unfolded “A Panorama of Rivers and Mountains”, which still causes a star-like sensational effect. Of course, the public is delighted to hear and see the blue-green landscape, with an excellent effect of display, and is easy to understand, and then we need to think further when we visit the exhibition: where the interest and material of blue-green landscape came from? How was the blue-green color blended and compromised in the native Chinese color? As well as the problem of the modernization of landscape painting, etc. 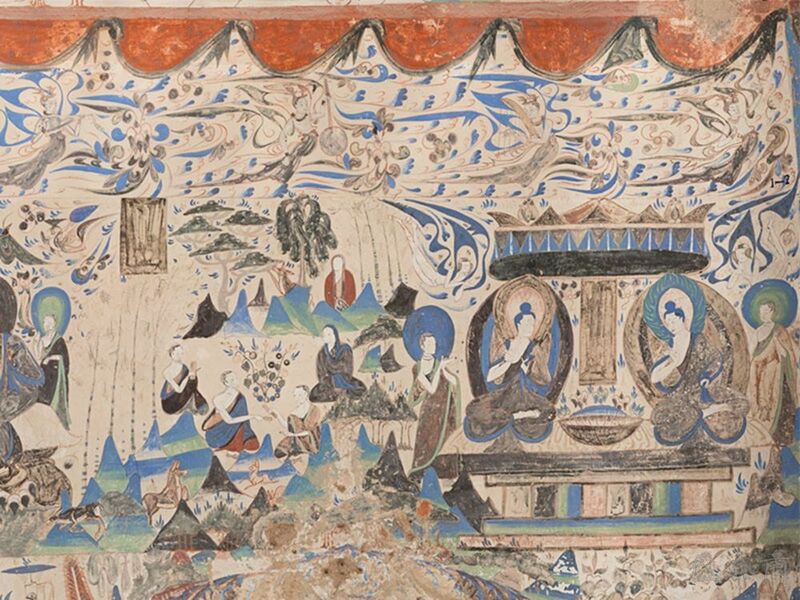 By sifting through a series of murals and scrolls, Shao Yan declared the blue-green was from the Western Regions or even West Asia, entering the Buddhist world, but it was not coherent with the red-and-black color system of the Central Plains, except for affecting some individual examples of the Western regions. In fact, Chinese ink painting of landscape was the mainstream in the Tang Dynasty, while it was rooted in the depths of the Chinese nation, rooted in the traditional red-and-black color system of the Han nationality; the blue-green was a foreign culture. Starting from Li Sixun, blue-green has a relationship with the immortal. The royal families of Tang and Song both believed that their ancestors were from the Taoist immortals. The reason why the blue-green could be used in the expression of Taoist wonderland was because this color originally came from the “foreign wonderland”. 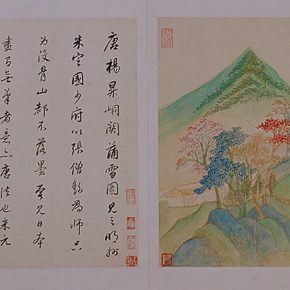 The paintings of “A Panorama of Rivers and Mountains” and “The Autumn of Rivers and Mountains” might show the Taoist immortals and wonderland. It seemingly performed the Taoist wonderland, and the composition looks like a manuscript for mural painting, specifically designed for a Taoist temple. 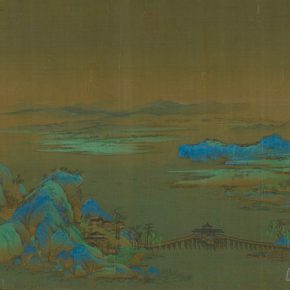 “A Panorama of Rivers and Mountains” is the only surviving traditional Chinese painting to use heavy recoating, and she boldly guessed that, Li Tang’s “Wind in Pines among a Myriad Valley” might use this system, but the color fell off later. There is another tradition, namely literati light blue-green landscape, through the use of light blue-green and light blue-red. 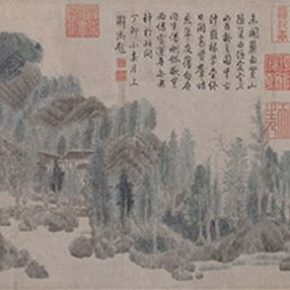 This technique might absorb the foreign blue-green, which was applied in some paintings, including Wang Shen’s “The River and Peaks Rising One Higher than Another, Surrounded by the Fog”, Zhao Bosu’s “Millions of Pines and the Golden Imperial City”, as well as Qian Xuan’s “Floating Jade Mountain Household”. 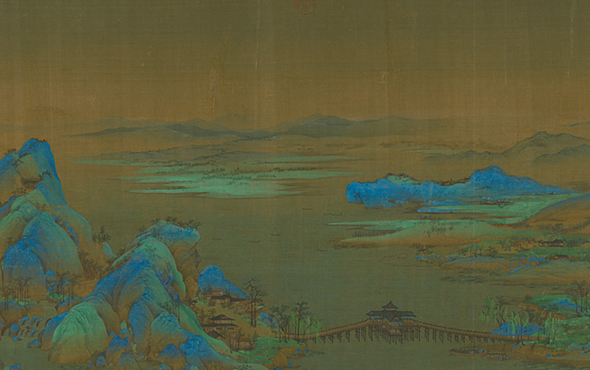 In the Ming Dynasty, “blue-green for market” removed the previous religious color, color used purely for the visual effect. Although it declared that it was modeled on an antique, it was an innovation. It is the third tradition, and it continued to follow this trend in the Qing Dynasty until modern times. 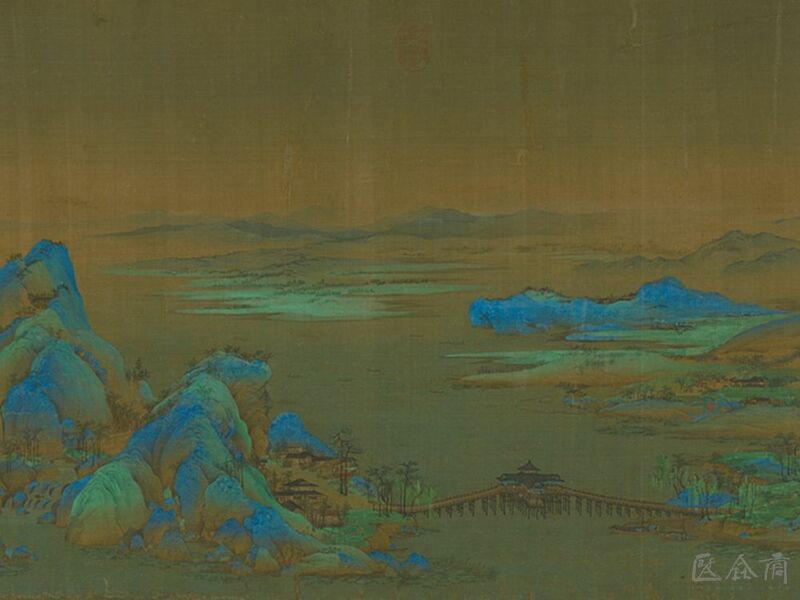 Qiu Ying’s blue-green is still decorative, but we now find that blue-green seems to be a substitute for ink, seen from Dong Qichang and Lan Ying’s works, freely coating the mountains and stones, while the blue-green has joined the ink painting, to become a member of “various shades of Chinese ink”. Blue-green finally arrived in China and transformed to a new form. Zhang Daqian was the painter who brought blue-green to the modern world because blue-green is a foreign thing, it is easier to be modern. 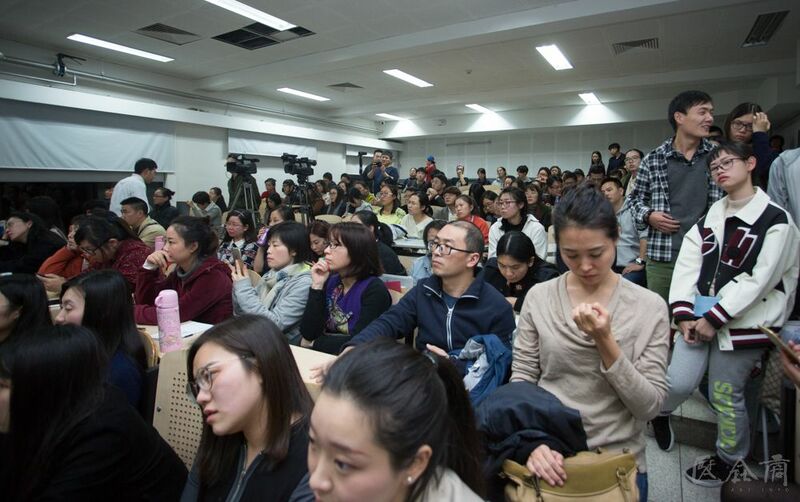 At the end of the lecture, Shao Yan had an interaction and discussion on “A Panorama of Rivers and Mountains” with the audience.